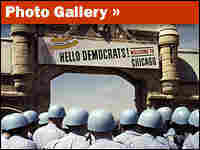 1968 Convention Sparked Reforms For Democrats Many Democrats saw the unruly 1968 convention in Chicago as one of the reasons they lost the presidential election to Richard Nixon that year. That defeat and a landslide loss four years later led the Democrats to change the way they approached conventions. Many Democrats saw the unruly 1968 convention in Chicago as one of the reasons they lost the presidential election to Richard Nixon that year. That defeat and a landslide loss four years later led the Democrats to change the way they approached conventions. We're looking back all this year 40 years to tumultuous moments of 1968. One of those was the Democratic convention in Chicago, which followed months of political turmoil throughout the country, including assassinations and anti-war demonstrations. At that convention, police battled protestors in the street. Many Democrats saw this unruly convention as one of the reasons they lost the election to Richard Nixon. That defeat in a landslide loss four years later led the Democrats to change the way they approach conventions. NPR's Linda Wertheimer has more. LINDA WERTHEIMER: Before 1968, powerful people and party bosses around the country picked delegates to the conventions. Their delegates then choose the nominee. There were factional battles at party conventions, but civilians were not involved until the general election. In 1968, Democrats decided future conventions should fairly represent Democratic voters. South Dakota Senator George McGovern chaired a reform commission, which ended what he called presidential selection by middle-aged, middle-class white men. Senator GEORGE MCGOVERN (Democrat, South Dakota): I'm not against people like that. I was one myself in 1968 and '72. But that's not the Democratic way to select a presidential nominee. WERTHEIMER: McGovern's reforms included women, minorities and young people chosen in an open manner. At the 1972 Miami convention, Senator McGovern was himself the nominee, but chaos reined. Disputes and speeches went on so long, he made his acceptance speech in the wee small hours. Sen. MCGOVERN: If we had that to do over again, I can guarantee you the 1972 people who were for me would have a much more disciplined convention, and we would not have allowed seconding speeches for a running mate that ran until about 2:30 in the morning. I had to give my acceptance speech after that. That was a disaster. WERTHEIMER: That obsession with fair representation became a joke at the Republican convention, also held in Miami that year. California Governor Ronald Reagan, better known then as a former movie actor, told the crowd the GOP would have a very different convention. President RONALD REAGAN: The McGovern party had named its candidate. He was on television later than some of my pictures. WERTHEIMER: The Republicans wanted their Miami meeting to be perfect, on script, a contrast between a president who could control its convention and a nominee who could not. David Gergen, who teaches at Harvard now, was working for President Richard Nixon. Mr. DAVID GERGEN (Harvard University): By 1972, the Republicans were determined to have a highly scripted, highly choreographed convention that would appeal to people through television. I was just a young kid then, working in the White House, had never been to a political convention, and was tapped to pull together the script for the 1972 convention. WERTHEIMER: Gergen was told to ask comedian Bob Hope for joke writers to produce fresh material to keep the convention moving along. It was the first of the highly produced, ready-for-primetime conventions. Mr. GERGEN: First time I met Ronald Reagan, he was just about to go up to the podium, and I came running over with a couple of jokes for his speech. And he had all these index cards, and he looked at me - who the hell are you, kid? Go away. You must be one of those jackasses from the Nixon White House. But it did work. Nixon actually got an eight-point bounce out of that convention. WERTHEIMER: By 1976, Democrats decided the fairest way to pick convention delegates was through primaries and caucuses open to the public. But reforms produced an unexpected result. President JIMMY CARTER: My name is Jimmy Carter, and I'm running for president. WERTHEIMER: The governor of Georgia, Jimmy Carter, at the 1976 New York convention. He introduced himself in just that way to thousands of voters and won the nomination. Nothing remotely like that had ever happened. Jody Powell is a Washington lobbyist now. He was part of the Carter campaign. Mr. JODY POWELL (Washington Lobbyist): If this had been a nomination process that was essentially controlled by the leadership of the Democratic Party, then Jimmy Carter would have stood no chance. WERTHEIMER: Carter, Powell and the late Hamilton Jordan looked at the new primaries and caucuses the Democratic reforms put in place and saw their chance. They could begin in the small farm state of Iowa, where they could run a low-budget campaign and perhaps create political momentum. Mr. POWELL: So, if we could win in Iowa and win in New Hampshire, we just might have enough money to compete effectively in Florida. WERTHEIMER: The Carter blueprint, outlined there, has been followed by candidates ever since, including Republicans. When Democratic state legislatures created primaries and caucuses for the Democrats, Republicans were automatically included. Then primaries spread to other states, which wanted to participate. Sen. OBAMA: …our primary season has finally come to an end. WERTHEIMER: That was Barack Obama claiming the Democratic nomination this summer. Like Jimmy Carter in 1976, Obama saw an opportunity in the evolving reforms of '68. Still trying to make nominations fair, in the 90s, Democrats eliminated winner take all and went for proportional representation. Elaine Kamarck is a member of the Democratic National Committee and a lecturer at Harvard. Dr. ELAINE KAMARCK (Democratic National Committee; Lecturer, Harvard University): What Barack Obama understood was that this was not a state-by-state race. This was a congressional-district-by-congressional-district race. And you saw that in the exquisite attention they paid to small caucus states, like Alaska, like Kansas. WERTHEIMER: While Hillary Clinton pursued a big state strategy, Barack Obama hunted delegates in caucuses, in small states, in black congressional districts and Republicans states, building momentum and building a lead. The Obama campaign understood that rules on proportional representation would mean that Clinton's wins in big states could not overcome that lead. Dr. KAMARCK: When Hillary Clinton was winning big states, she was not winning big delegate totals. And the reason is that the Democrats' proportional system - because it does not allow for fractions - basically rewards the loser in a two-way race. WERTHEIMER: In Ohio, Texas and Pennsylvania, for instance, where Clinton won, but basically split the delegates. The 1968 reforms did one very big thing: put the voters, not the party leaders, in charge of choosing candidates. That made come-from-nowhere candidates possible. And since nominees are now picked in primaries and caucuses, the conventions became mainly a performance space - good thing or bad thing? Senator McGovern says he can't think of any bad results from the reforms. Jody Powell is a little bit nostalgic for the days when nominees were chosen at the conventions after the famous bruising floor fight. Mr. POWELL: There's no suspense. There's no mystery. There's news value to it. People just don't watch it. Yet it's good to be able to keep bad things from happening, but the downside is if there's going to be no wrecks in the race, no one wants to watch the race. WERTHEIMER: The 2008 Democratic convention starts today in Denver. Democrats are gathering for their national convention in Denver with their party divided by a bruising presidential nomination contest and the country mired in an unpopular war. The situation was similar 40 years ago, when Democrats convened in Chicago. But what riveted the nation's attention were the battles in the streets between Vietnam War protesters and police. A federal commission later called it a police riot, and the mayhem outside the Chicago convention continues to influence political protests today. No one who knew Chicago thought August 1968 would be another Summer of Love. The Chicago Seed, an alternative weekly newspaper, wrote: "If you're coming to Chicago, be sure to wear some armor in your hair." Mayor Richard J. Daley had amassed a force of 12,000 police officers, 6,000 National Guard members and 6,000 Army troops. He assured convention delegates that all would be well. 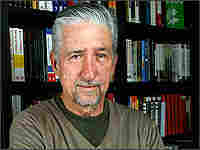 One of the chief organizers of the anti-war demonstrations, Tom Hayden, says protest leaders worked for months to get permits from the city to march, to rally and to camp in the parks. "We were used to the idea that authorities would stall on permits, but I think some of us thought that the permits would come through at the end, so we went forward," he says. But the permits didn't come. So there was almost nothing protesters could do without violating the law. The massive crowd that the organizers hoped for didn't materialize. "When the week started, there were only 600 or 700 people in the park," Hayden says. "It grew to about 10,000, nearly all of them from Chicago." Violence became a daily event, with marches and rallies broken up by police with nightsticks and tear gas. It was the same most nights in the parks. Protesters would gather, and after the 11 p.m. curfew, the police would move in with clubs and gas, chasing them into the streets. On one of those nights, Vivian Stovall and a mixed-race group of friends sat down in Grant Park and formed a human chain. "Next thing we knew, we were being kicked, being pulled apart and some very racial statements being made. And then I looked up, and when I looked up that's when I got hit. I still have the scar right here," Stovall says, pointing to her eyebrow. "I remember feeling that warm wet stuff on my face, and I was bleeding." She was 19 years old in 1968. She'd been driving from Washington, D.C., to Louisiana to start the new semester at Grambling State University when she and some classmates decided to take a detour to Chicago. "We were talking while we were on our way there about the assassination of Robert Kennedy, the assassination of Martin Luther King [Jr.]. We talked about the Vietnam War," Stovall says. "We just felt nobody was listening to us at that time anyway, and we wanted to just have our say or at least be part of something." The most infamous battle took place on Aug. 28 outside the Conrad Hilton hotel. It wasn't the most violent confrontation that week by most accounts, but it's the one that got the most news coverage, because the Hilton was where the media were stationed. "Now they're moving in, the cops are moving and they are really belting these characters. They're grabbing them, sticks are flailing. People are laying on the ground. I can see them, colored people. Cops are just belting them; cops are just laying it in. There's piles of bodies on the street. There's no question about it. You can hear the screams, and there's a guy they're just dragging along the street and they don't care. I don't think ... I don't know if he's alive or dead. Holy Jesus, look at him. Five of them are belting him, really, oh, this man will never get up." It's not the sort of experience anyone would want to repeat. But there are people who see something in those days worth reviving. Mark Cohen is the co-founder of the activist group Recreate '68. Although he wasn't in Chicago in 1968 — he was in Africa with the Peace Corps — Cohen says his organization's name was meant to get attention and recall the spirit of the '60s, not the violence. He's been planning to protest at this week's Democratic convention since he heard it was coming to his hometown of Denver. "The reason we're protesting is because Mr. Obama's reputation as a progressive is not really deserved," Cohen says. "For example, his so-called anti-war stance involves a program to remove combat troops from Iraq over a period of 16 months. The majority of American people want those troops removed immediately. As soon as possible." He was standing in what will be the official demonstration zone for the convention. He and the rest of Recreate '68 will be in parking lot A, nearly 300 yards from the convention hall. "We call it the freedom cage," says Cohen, 62. The zone will be ringed by two layers of fencing behind a huge white tent set up for the media. And for protest marches, the sanctioned route will leave marchers more than a quarter of a mile from the convention site. Recreate '68 and other groups sued the city of Denver and the Secret Service to get closer to the action, but a federal judge upheld the city's plans. Katherine Archuleta, Denver's lead planner for the convention, said the demonstration zone provides a fair and safe platform for activists. "People can go and come as they like. The other thing that we are doing in the demonstration zone is to provide a stage and speakers and microphone, so that they can be heard [at] a greater distance," Archuleta says. "And that's the city's role — finding a balance between safety and security and the rights of those who would come and want to raise their voices." Hayden doesn't see it that way. "I don't mean to exaggerate, but it is the end of freedom. This is the freedom to protest as designed for you by any authoritarian state under the direction of the police," he says. Caged or not, when demonstrators raise their voices in Denver, they will be talking — or singing or shouting — about more than the war in Iraq. The environment will be on the agenda, as well as poverty, health care, immigrant rights and more. Michael Heaney, a political scientist at the University of Florida, says that because of 1968, "we've now become a 'movement society.' "
"What 1968 demonstrated was that protest could be an effective tactic for bringing about social change," he says. "So important new protest tactics were invented: the sit-in, the large demonstration. And people learned that this was a way they could effectively influence the government." Heaney's been studying the current anti-war movement and has noticed something interesting about who's in it. He says there are essentially two groups — one made up of people who were active in the anti-war movement 40 years ago, and the other made up of people in their 20s — and very little in between. The convention protests planned in Denver will have a kind of retro quality. In addition to Recreate '68, there's another activist group called Tent State University, a reference to Kent State in Ohio, where four students were killed while protesting the war in Vietnam. Meanwhile, the organization that Hayden helped found in the 1960s, Students for a Democratic Society, is springing up again on college campuses. Over the past four decades, Hayden has gone from outside agitator to Democratic Party insider. He served in the California state Legislature for 18 years and has been a delegate to national Democratic conventions six times. Stovall has also become a party activist. She's been to four conventions, and she'll be in Denver as a delegate for Barack Obama. It's kind of silly, she says, to try to keep protesters away from the delegates, many of whom have put in time on picket lines and marches just like she has. "A large percentage of those delegates have people out there who are rallying or protesting issues that they care about," Stovall says. "And as a matter of fact, as a delegate, I might get out there myself."